Overstock.com voucher only $10 for $20 worth of goodies + FREE SHIPPING! Eversave is offering a voucher to Overstock.com today! For only $10 you can score $20 worth of goodies plus FREE SHIPPING! Limit one Save per person. 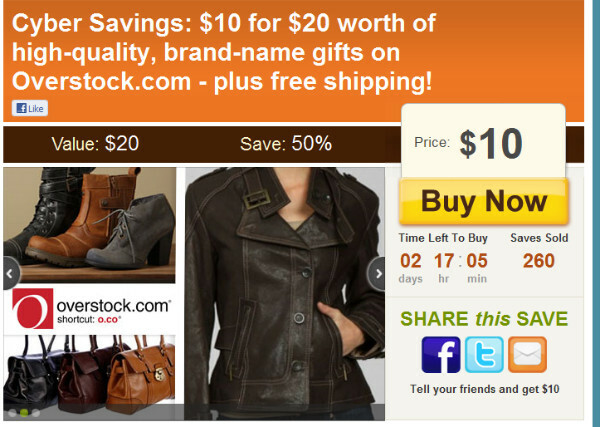 Valid at Overstock.com. It cannot be combined with other coupon codes. Free shipping is included until 12/25/2011! Coupon code is available one day after purchase at 12:00 PM EST.